The Massachusetts Human Resources Division (Mass. HRD) administers the entrance examination for the positions of Municipal & MBTA Police Officer, Correction Officer, and Firefighter. You may apply on-line for these and other Mass. civil service exams. The WAT is administered to measure cognitive abilities that have been identified as essential to performing the duties of a Police Officer. The WAT includes areas of verbal expression, verbal comprehension, problem sensitivity, deductive reasoning, inductive reasoning, and information ordering. The Work Styles Questionnaire (WSQ). The LES consists of a series of multiple-choice questions related to candidates' past history and experience of potential relevance to successful performance of entry-level police officers. Mass. HRD (the Human Resources Division) will score all three components (WAT, WSQ, & LES) and your scores from will be combined to determine your continued eligibility in the selection process. The components are administered in the order in which they appear above. Candidates should Download the 2007 Police Officer Assessment Preparation Guide to prepare for the exam. Also, candidates would be well advised to take a police officer entrance examination preparation course, such as the one offered by Attorney Patrick M. Rogers of Commonwealth Police Service, Inc. This seminar will help with your preparation in becoming a successful candidate for the position of civil service municipal police officer within the Commonwealth of Massachusetts. Becoming a successful candidate is based solely on your examination score. Therefore, it is absolutely necessary to be a high ranking applicant in order to be considered for selection. This seminar will help you obtain the competitive edge. If you take a Civil Service Entrance Examination and you are bypassed for appointment, you have the right to appeal to the Civil Service Commission. Your appeal must be filed within 60 days of receiving the bypass notice. You may also appeal Mass. HRD's determination regarding such issues as residency, examination eligibility, and training & experience credit. 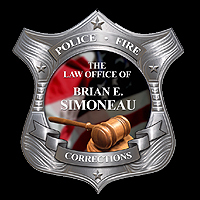 The Law office of Brian E. Simoneau represents litigants at all stages of civil service proceedings. Attorney Simoneau and his associates handle appeals before the Human Resources Division, the Civil Service Commission, and Superior Court. Candidates who have been bypassed for appointment or promotion, or are otherwise in need of legal intervention, are urged to contact Attorney Simoneau as soon as possible. © 2007 The Law Office of Brian E. Simoneau.